Fig. (3) Overexpression of Gp07, its domains (rNTD, rCTD), Δgp07 and a control protein in E. coli. Overexpression of the recombinant proteins (induced with 0.5mM IPTG for 2hrs at 37oC) were analysed on SDS-12%-PAGE. 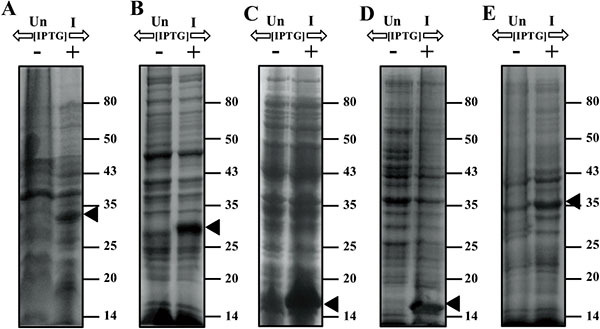 (A) Overexpression of Gp07 (B) Overexpression of ΔGp07 (C) Overexpression of rNTD; (D) Overexpression of rCTD; (E) Overexpression of control protein. Arrowheads indicate the overexpressed protein. Un indicates uninduced cellular extract; I indicates induced cellular extract.